Screenwriting Basics — Slugline. Simply Screenwriting. Every movie starts as a humble stack of paper less than an inch thick. That an experience so epic and emotional can come from such humble beginnings is a big part of the allure of writing movies. Screenwriting is hard, and cultivating a career in screenwriting is even harder—but there is truly nothing between you and the end result except words on a page. Slugline strives to be the minimum possible thing between you and those words. Each element has a standard format, including margins and text styling — but, as you can see, it’s never more than what could be achieved with a typewriter. You almost never have to tell Slugline what kind of element you’re writing. Just start typing, and Slugline will figure it out. The first screenplay Element type is a Scene Heading, also known as a Slugline. Scene Headings mark any change in location or time in your screenplay. Every scene begins with one. “INT/EXT” is often used for scenes in vehicles. The period doesn’t print — it’s just used to “hint” the formatting of the line. You can either type the period manually, or choose Format → Force Scene Heading. Scene Headings are always shown in UPPERCASE. As you create them, Slugline handles this for you. Action is the catchall element of screenwriting. It’s where you tell the reader what happens on the screen. If you type a line entirely in UPPERCASE, Slugline will assume you’ve typed a Character, and will set you up to begin typing Dialogue when you press Return. If that’s not what you want, just press Return again. Slugline remembers your Character names, and will suggest them to you if you begin typing them at the start of a new line. In Slugline, Dialogue cannot exist without a Character element immediately before it. He's coming in. I feel safer already. If you type an open paren ( after a Character element, Slugline adds the closing paren ) and places the cursor between them so you can type your parenthetical. When you’re done, you can press Return without having to move the cursor outside of the parentheses. Transitions are used to indicate special information about how one scene transitions to another. They are not as common as they once were, but they are still useful. Transitions are in UPPERCASE and end in TO:. If you want a Transition that doesn’t end in TO:, begin the line with a greater-than symbol. You can do this easily by placing the cursor on the line you wish to transform into a Transition, and choosing Format → Force Transition. If you’ve been using email for a while, chances are you’ve seen someone wrap a word with asterisks for *emphasis. * Slugline uses this convention as well. To underline something, wrap it in _underscores_. Of course, all your usual keyboard shortcuts work too. Select any text and press ⌘B to make it bold, ⌘I to italicize, or ⌘U to underline. What you see as you write in Slugline looks a lot like a printed screenplay, but in fact, you’re seeing the raw text file you’re creating. This includes some “invisible” elements, such as the asterisks that make text **bold,** or the leading period that marks a Scene Heading. 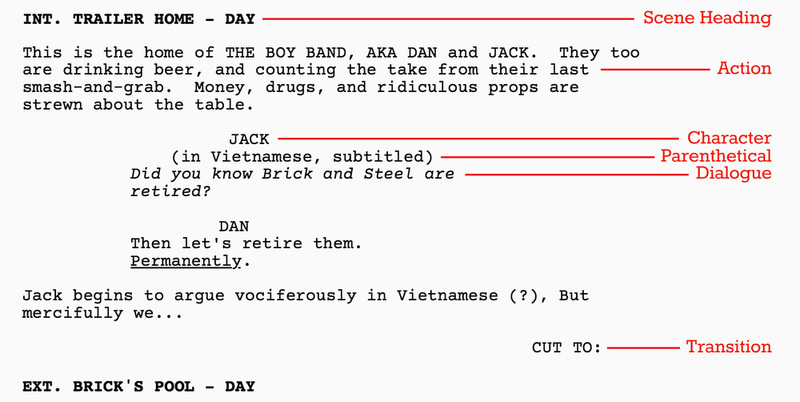 Slugline shows these characters in light gray, to let you know that they will not be seen in your printed screenplay. At any time, you can see how your screenplay will appear in print, without these invisible elements. Just press the Preview button at the bottom right (or press ⇧⌘P). When you’re ready to resume writing, press ESC — or choose File → Print to print a perfect, industry-formatted screenplay, to paper or PDF. Slugline automatically helps you add the correct number of carriage returns at the end of each line you type. There should be one, and only one, empty line between Scene Headings, Action, and Transitions. There should be no empty lines between Character, Parenthetical, and Dialogue.